Here he's with BUZZ ALDRIN!!! The actor’s comments came as he met his childhood hero at an event in London. George Clooney has said he was so awestruck by the 1969 moon landings as a child that he made his own version of Buzz Aldrin’s watch out of paper. The 55-year-old star’s comments came as he met his childhood hero at an event in London’s Tate Modern on Wednesday. He told guests: “Yes, I did make an Omega Speedmaster watch (out of paper) as a kid – it was right twice a day. “Everybody had them when I was growing up because they were a big part of the moon landings, which were of course huge in our lives. The event celebrated the 60th anniversary of the Speedmaster, which has been worn by a number of astronauts venturing into space. George and Buzz were introduced by TV physicist Professor Brian Cox, but the actor confessed he would never have had the courage to follow in the footsteps of his idol. “I’m a coward,” he confessed. But he did dabble in space travel when starring in 2013 blockbuster drama Gravity. “It’s a great honour to be able to represent people who did such great things,” he said. The star-studded dinner event was attended by the likes of actresses Gemma Arterton and Liv Tyler, and singers Pixie Lott and Ellie Goulding. A host of famous faces attended the Omega Lost In Space anniversary event on Wednesday night. The bash, held at the Tate Modern in London, celebrated the 60th anniversary of the Omega Speedmaster, which has been worn by every piloted NASA mission since 1965. 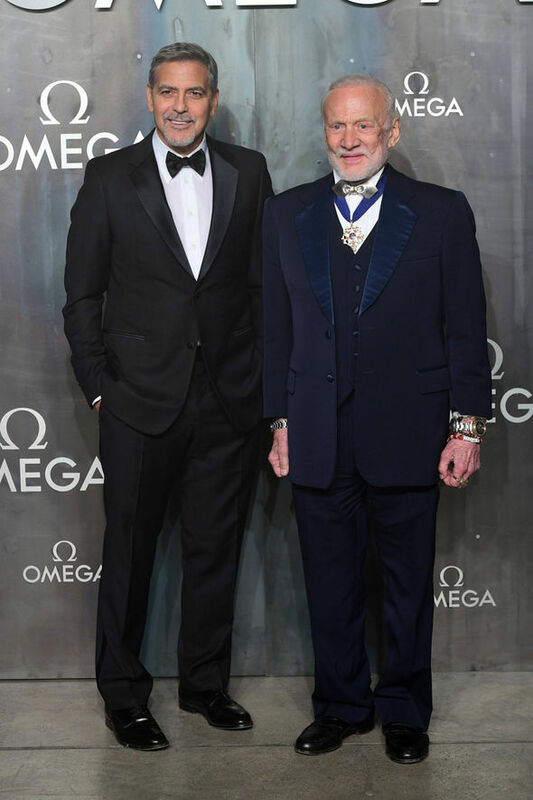 George Clooney, who was flying solo for the occasion, looked all kinds of dapper as he took to the stage with his co-host, former astronaut Buzz Aldrin. The actor was also pictured on a dinner table with Liv Tyler who stunned in a pink print dress that featured a red pleated skirt. Actor George Clooney has told how he was so awestruck by the 1969 moon landings as a child that he made his own version of Buzz Aldrin's watch out of paper. The 55-year-old star's comments came as he met his childhood hero at an event in London's Tate Modern museum on Wednesday. He told guests: "Yes, I did make an Omega Speedmaster watch (out of paper) as a kid - it was right twice a day. "Everybody had them when I was growing up because they were a big part of the moon landings, which were of course huge in our lives. "We got to go home from school early and then later my father gave me one of my own as a graduation present - so it was a huge part of my life." Clooney and Aldrin were introduced by TV physicist Professor Brian Cox, but the actor confessed he would never have had the courage to follow in the footsteps of his idol. "I'm a coward," he confessed. "It was nice to see the reception the astronauts received, but if you ever saw the model they did it in, it looked like a 1950s Chevy- it was hard to imagine how that could take you into space and back." "It's a great honour to be able to represent people who did such great things," he said. Asked how he felt about meeting the Hollywood giant, Aldrin joked: "It's like walking with the stars again." It's only 30 odd miles to London, and it's still only April.... where's Amal?? 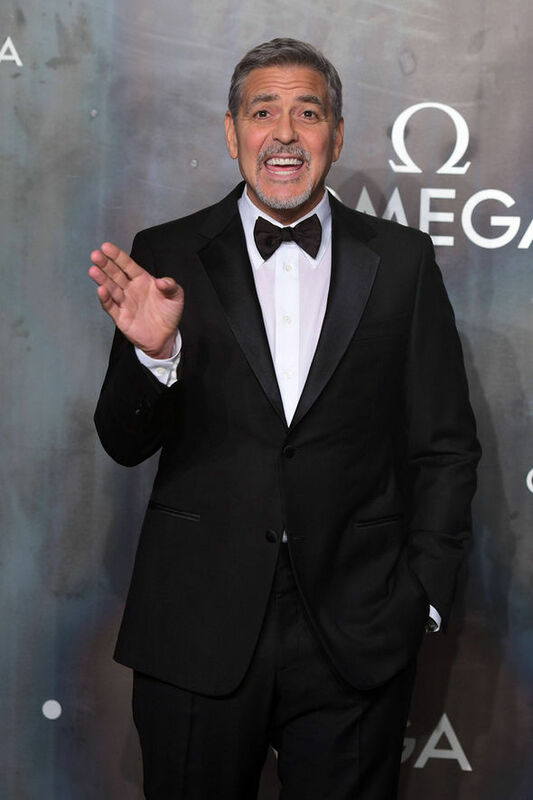 EVENTS don't get much swankier than last night's Omega anniversary party but George Clooney seemingly couldn't resist injecting the lavish proceedings with a touch of playfulness last night. 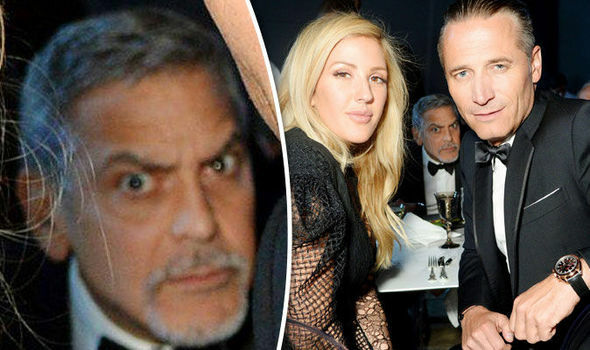 The Hollywood heavyweight no doubt left his fellow party-goers laughing after photobombing a snap of Ellie Goulding and Omega CEO Raynald Aeschilmann. While the two stars turned to face their camera for a glamorous photograph together, the 55-year-old star positioned his head between their bodies and pulled a silly facial expression. Both Ellie and Raynald seemed completely unaware of the prank as they continued to pucker their best poses for the lens. George's wife Amal was noticeably absent from last night's proceeding, though it's no surprise given that the humanitarian lawyer is currently expecting twins. Instead, the Ocean's Eleven star - who hosted the star-studded event - was pictured sharing the red carpet with former astronaut Buzz Aldrin. The bash, held at London's Tate Modern, celebrated the 60th anniversary of Omega Speedmaster, which has been worn by every piloted NASA mission since 1965. Speaking at the event, George revealed that he grew up dreaming of owning the timepiece, and once made his own watch out of paper. "I did make an Omega Speedmaster," he enthused. "It was a right twice a day. "Everybody had them when I was growing up because they were a big part of the moon landings, which were of course huge in our lives… and then later my father gave me one of my own as a graduation present. it was a huge part of my life." 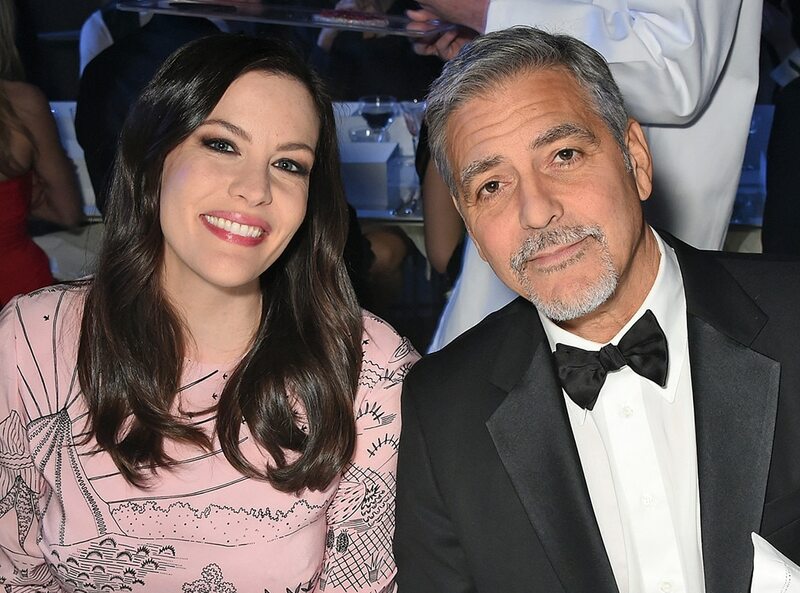 Liv Tyler, Ellie Goulding and Joely Richardson were among the other stars at last night's event. She went to Shanghi with him for Omega... why not go to London when he's going to meet one of his heroes. She wasn't in the Nespresso ad either.....Really????????????? ?.thanks for pointing that out PAN. She went to Shanghai with George for the Tomorrowland promoting, and they did some sightseeings in both locations. Amal made the red carpet in Tokyo but stayed in hotel in Shanghai due to her work. This all happened in May 2015. George visited Shanghai alone for Omega a year before, shortly after the engagement. Oh wow, love the 'flying' pictures with Buzz Aldrin. Just a shame George was mugging so much in the pics. Aldrin looks surprisingly dignified given the situation.